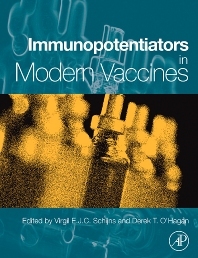 Immunopotentiators in Modern Vaccines provides an in-depth insight and overview of a number of most promising immunopotentiators in modern vaccines. In contrast to existing books on the subject it provides recent data on the critical mechanisms governing the activity of vaccine adjuvants and delivery systems. Knowledge of immunological pathways and scenarios of the cells and molecules involved is described and depicted in comprehensive illustrations. Small-molecule immune potentiators: the future of adjuvants? Dr. Virgil E.J.C. Schijns is special guest Professor in Cell Biology & Immunology group, Wageningen University, 6708 WD Wageningen, The Netherlands. Dr. Schijns received his Ph.D. degree at Utrecht University in 1990. Recent professional appointments are Chief Scientific Officer at ERC in Belgium and The Netherlands, (2011 to present); Chief Technology Officer, Vice-president at a small biotech spin-off from Utrecht University (2008 to 2011); Special professor immune Intervention, Wageningen University and Research center (2008 to present); Special Professor in Immunology and Virology at North Carolina State University (NCSU), Raleigh. Department of Population Health and Pathobiology (2002 to present) and Head of Department for Vaccine Technology and Immunology (VTI), AKZO NOBEL (1999 to 2008). Dr. Derek O’Hagan was the Global Head of Vaccine Chemistry and Formulation Research for Novartis Vaccines, based in Cambridge, MA until acquisition by GSK in March, 2015. He managed research teams (~50 total staff) in Cambridge and Siena, Italy. He originally qualified as a pharmacist in the UK, and is a former academic researcher who has worked on vaccine delivery in the industry since 1993. He was formerly a Lecturer in Drug Delivery at the Department of Pharmaceutical Sciences, University of Nottingham, UK, and received research funding from the World Health Organization, The Wellcome Trust and the Medical Research Council. He was recruited into the US in 1993, and moved to progress basic research into clinical evaluation, then subsequently worked on several vaccine delivery systems that were evaluated in the clinic, including novel adjuvants, nucleic acid vaccines and needle free vaccines. In the mid 1990’s, Dr. O’Hagan worked on the emulsion adjuvant MF59, which is now included in a licensed flu vaccine in more than 40 countries and is progressing towards licensure in the US. He has co-authored >140 original research publications, >60 book chapters and reviews and I am a named inventor on >60 filed patents. He was awarded the Conference Science medal of the Royal Pharmaceutical Society of Great Britain in 1997, and the Young Investigator Research Achievement Award of the Controlled Release Society in 1999. He was also named as the ‘most inventive scientist’ in Chiron in 2004 and was the lead author on the most cited paper in ‘Vaccine’ 2008-10. Dr. O’Hagan served on the Board of Scientific Advisors for the Controlled Release Society and is a Fellow of the American Association of Pharmaceutical Scientists.